ONE DAY JESUSand his twelve disciples left Capernaum and took the south road leading through the country of Samaria. They were going to Jerusalem. On their way they came to a certain village in Samaria where Jesus wished to spend the night. So he sent messengers to find a place for him and for his disciples to rest. But the Samaritans in the village would not permit Jesus and his disciples to stop with them. They would not allow them to rest in their village. They knew Jesus and his disciples were Jews, and the Jews had often been unkind to their people. Now they, too, would be unkind. But Jesus answered, “Your desire is not good, for the Son of man is not come to destroy men’s lives, but to save them.” Then he went with his disciples to another village. And as they went a man came to Jesus and said, “Lord, I too would follow you wherever you go.” No doubt he believed as did the disciples, that Jesus would soon be the great king of the Jews for whom so many were looking, and he desired to be a friend of such a great person. 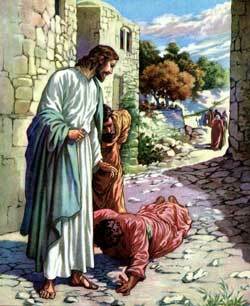 Ten men who were lepers saw Jesus and his disciples passing by. These men had heard about Jesus how he healed other lepers, and now they called loudly to him, for they stood far off. They cried out, “Jesus, master, have mercy on us!” And Jesus heard their cries.